The following tutorial will demonstrate how to use Bricks and Bricklets with the Programming Interface. In the first part we use the DC Brick to drive a motor. After this we make the velocity of this motor controllable by a rotary potentiometer by attaching a Rotary Poti Bricklet. At the end we show how to stack Bricks together to reduce wiring and communicate over wireless or cable based interfaces. We choose the DC Brick as a representative throughout this tutorial. It is however easily possible to transfer the concepts shown to other Bricks. Click here for an overview of all available Bricks. To test the DC Brick you need to have the Brick Daemon and the Brick Viewer installed (for installation guides click here and here). The Brick Viewer has to be connected to the Brick Daemon, click the "Connect" button in Brick Viewer to ensure this. The Brick Daemon is a bridge between the Bricks/Bricklets and the programming language specific API bindings. The Brick Viewer provides a graphical interface for testing purposes. 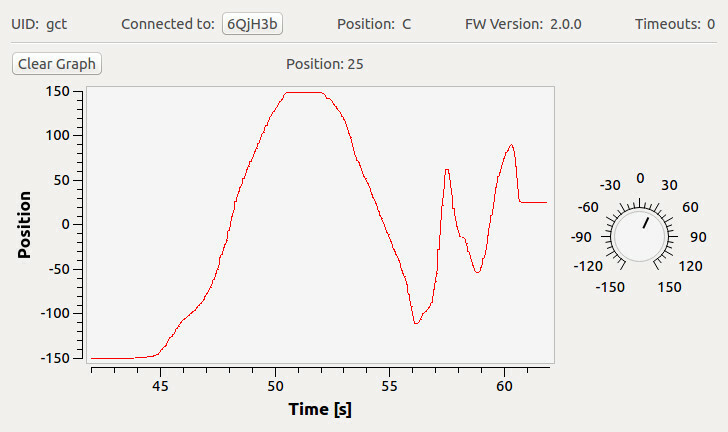 You can see the voltage of the connected battery as "External Voltage" and the current used by the motor as "Current Consumption" as well as a representation of the current velocity on the right side. 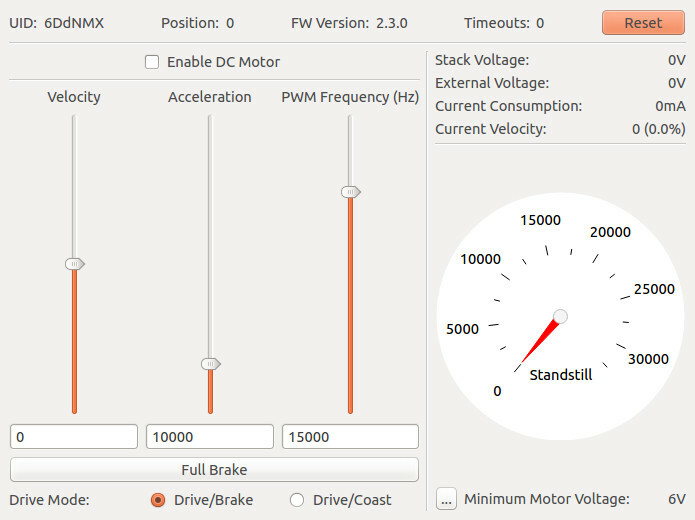 Different sliders allow you to modify velocity and acceleration of the motor as well as the PWM frequency of the driver. After clicking "Enable" you are in control of the motor. The DC Brick and motor are verified to work properly, there is now nothing in the way to write a first program that controls the DC Brick. You can choose one of the available programming languages, in this tutorial we use Python. The necessary steps to get everything working are essentially the same in all programming language. This tutorial together with the examples in the API documentation of every product should allow you to get any Brick working with any programming language. In the following we assume that you now the basics of the programming language you picked and that the necessary compilers/interpreters are already installed. First, install the API bindings for your programming language. Installation instructions for all API bindings can be found here. Now create a folder for your DC Brick test project. Download one of the examples for the DC Brick as a starting point from here and place it in the folder. Line 12 creates an IP Connection object. Line 13 creates an object that allows to control the DC Brick. It is necessary to pass the Unique Identifier (UID) of the Brick (in this example defined in Line 6) and the ipcon object. Change the UID corresponding to your device! The easiest way to get the UID of your device is to use the Brick Viewer. If you connect a device to the PC, the Viewer will display the UID in the "Setup" tab. In Line 15 the IP Connection is connected. It is possible to run your program on another PC than the one which has the Brick Daemon running (e.g. you can write a program for your smart phone that controls a Brick connected to your PC). The Lines 18-23 configure the DC Brick and let the motor run full speed forward. Line 25-27 is used to prevent program termination until you press enter. After this the motor is stopped before the program ends. Run this Python script and use it or other examples as a starting point for your own project. A full description of the API and further examples can be found in the description page of each product. In case of the DC Brick here. You can add Bricklets to extend the features of Bricks. Click here for an overview of available Bricklets. To use a Bricklet, connect it to your Brick over the supplied cable when the Brick is not powered. We use a Rotary Poti Bricklet and the DC Brick from the previous part of this tutorial, but it is easy to transfer the shown concepts to any Bricklet connected to any Brick. Connect the Rotary Poti Bricklet to your DC Brick as depicted in the image below. If you now connect the DC Brick to the PC, not only a "DC Brick" tab but also a "Rotary Poti Bricklet" tab will be shown in the Brick Viewer. Select the "Rotary Poti Bricklet" tab and rotate the potentiometer. You should see a corresponding movement in the viewer. Lines 4-7 are the typical configurations, the UID has to be changed according to the Bricks and Bricklets you use. In Lines 22-27 an IP Connection to the Brick Daemon is established and the Brick and Bricklet device objects are created. We configure the Rotary Poti Bricklet, such that it calls the function cb_position every time the position of the potentiometer changes. Line 29 configures this callback to be triggered with a period of 50ms if the position changes. If the position is unchanged there won't be any callbacks. This is an efficient implementation, only the bare minimum of USB bandwidth is used. The callback function is registered in Line 30. cb_position is defined in Lines 16-19, it sets a new velocity based on the current position of the potentiometer. In Lines 32-33 we enable the motor and set a maximum acceleration. This allows the motor to follow the potentiometer movements immediately. In Lines 35-37 we wait for user input to prevent program termination. After this the motor is stopped before the program ends. To reduce wiring and save space it is possible to stack Bricks. You need a Master Brick at the bottom with a PC connection to route the data between the PC and the Bricks in the stack. The stacking is transparent, that means there is no code change necessary between a version that uses Bricks separately connected over USB to a PC or a version with an additional Master and stacked Bricks. It is possible to use more than one Master Brick in a stack. But only the Master Brick at the bottom of the stack acts as the master of the stack. The other Master Bricks can however be used to connect more Bricklets. The master of a stack powers each device of the stack over its USB connection with a maximum of 500mA. Every driver Brick in the stack can to be powered by its own on-board power-connector. To again reduce wiring and save space it is possible to use a Power Supply, which is attached at the bottom of the stack (below the Master Brick). These boards power the stacks internal power signal. That means, that each driver Brick which is not powered by its on-board power-connector is powered through the stack by the Power Supply. Additionally the Power Supply creates a 5V signal to power the devices of the stack. No power is drawn from the PC if a Power Supply is used. This is especially useful if a small embedded device is utilized to control the Bricks and Bricklets, since it might not be able to deliver the needed power. The master of the stack can measure the voltage and the current flow of the connected power supply. Each driver Brick switches automatically to the stack internal power signal if no external supply is attached over the on-board power-connector. Keep this in mind! In the following we extend the previous part by attaching a Master Brick below the DC Brick with the connected Rotary Poti Bricklet. The white corners show how to plug the Bricks together. 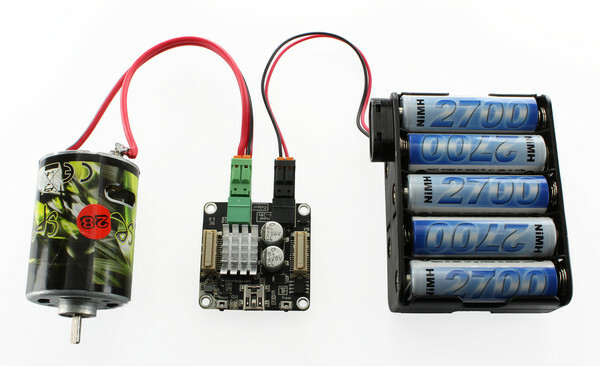 Build a stack consisting of a Step-Down Power Supply with connected battery, a Master Brick with connected Rotary Poti Bricklet and a DC Brick with connected motor (from bottom to top). This setup is depicted in the image below. If you connect the Master Brick to the PC over USB, the Brick Viewer should show the Master Brick (measuring current and voltage flowing through the stack), the DC Brick and the Rotary Poti Bricklet. Since the stacking is transparent you are able to run the program of the previous part without any changes! The stacks as shown so far in the tutorial are not super exciting, they only reduce wiring and save space. But, as you might have already guessed, there is more to it. It is possible to attach Master Extensions to the stack, which extend the stack with interfaces other than USB, e.g. RS485 or Wi-Fi, and Ethernet. To create a RS485 bus between two stacks, you need two need one Master Brick and two RS485 Master Extensions additionally to the previous part. Attach one RS485 Extension on top of your stack and build a new stack from the other RS485 Extension and the Master Brick. Wire up the two Extension. Finally, connect the Rotary Poti Bricklet to this new stack. Now connect each stack separately to your PC and configure it with the Brick Viewer as described in the RS485 documentation. It is necessary that you power up the slave stacks prior to the master stack. You should see two Master Bricks, the Rotary Poti Bricklet and the DC Brick in the Brick Viewer. If this is the case you can run your previously written code without any change.